Some of the finest music composed in the twentieth century. More than fifty standard songs from Gershwin, Strouse, Lane, Rodgers, Willson, Sondheim, and Berlin, a hit parade of music from the musicals. Intimate, relaxing, easy on the ears, full of vim and vigor when necessary. 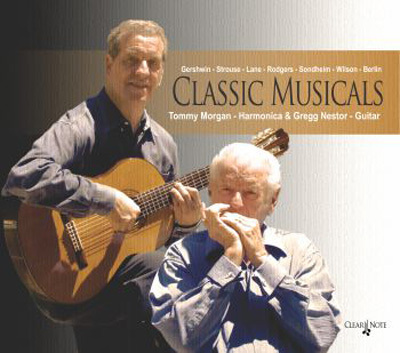 The partnership of Morgan and Nestor makes this CD sound like their 50th collaboration. The hour will quickly pass and you’ll want to hear it again and again. 'OKLAHOMA!' Richard Rodgers Oh, What a Beautiful Mornin' • The Farmer and The Cowman • Pore Jud is Daid • Many a New Day The Surrey With the Fringe on Top • Kansas City • People Will Say We're in Love • Oklahoma! Mr. Morgan’s Harmonicas by M. Hohner Inc.